Here in this segment, we are showing a selection of contemporary figurines that reflect today's moods and modern mise en scène. We look at contemporary artisan, artist, and designer side by side, each showing the strength of conviction which gives a true sense of the historic narrative of the applied art medium of figurines. 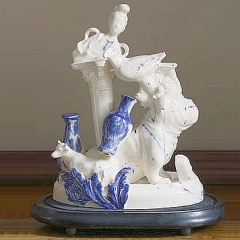 In this context, figurines can be animal as well as human forms. We believe most wholeheartedly that modern can be both beautiful and fascinating. "I think that we should put contemporary figurines into a separate category. Paul Smith goes here, so does Urban Gnomes - but also your Basia's designs do". "With much of my work in the 1990's for the big china firms, I was a designer sculptor, modelling products to order. 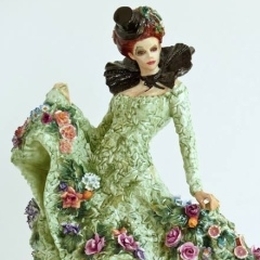 I loved the process of creating the ladies from clay, fell in love with each one, but essentially, they were looking outwards - aimed at pleasing the market - collectors and product developers. As the market waned, I didn't want to stop falling in love with my ladies, instead, more like a true artist would, rather than the outward looking commercial artist that I was, I started to look inwards, to decide what I wanted to do, not looking to please anybody other than myself". 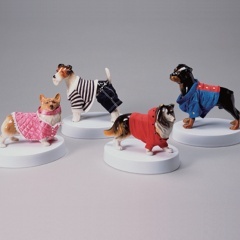 The result is his collaboration with Basia Zarzycka, figurines with tiny editions of 25 worldwide (see above photo). 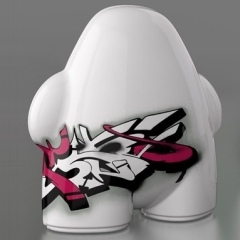 Urban Gnomes by vitamin are smart, smart design. Urban, astute, sharp. Paul Smith, on the other hand does 'art'. Yet they sit side by side very well. 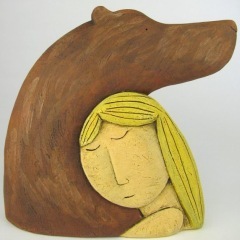 Claire Partington makes what can only be described as exquisitely mystical figurines. She uses the same old fashioned English techniques used for 300 years, yet enriches the medium with a modern glow. 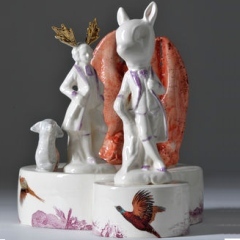 Similarly, Sally MacDonell, with her figures, is using very sound and traditional techniques, forever exploring and renewing the possibility of colour and glaze. However, MacDonell is putting a magnifying glass to people, their moods and tell-tale body language. Laurance Simon uses figurines (human and animal) to adorn his surreal settings. There is a constant narrative of sideways references in Simon's work which both amuses and provokes. Someone else producing a thoroughly modern take on an old subject (in this case, animal figurines) is Susan O'Byrne. 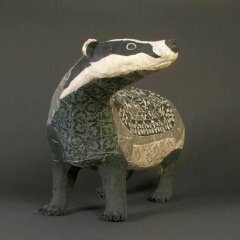 "Throughout history animals have also been used in storytelling, legend and folklore to simplify the complexities of adult life. In the same manner, I use the animal form as a vehicle for the expression of human emotions." 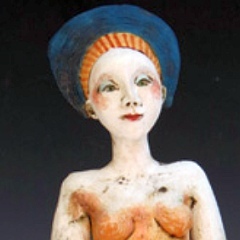 O'Byrne is working in mixed media to get her distinctive contemporary look, but uses a fired porcelain paperclay, very much a modern medium for today's artists. 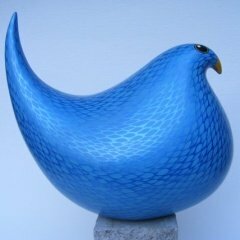 Another contemporary ceramic animalier is Maggie Davies - her speciality is a series of striking and compelling birds. Look at her blue bird above - every piece of the decoration is done by hand with tiny brushes. She gets those smooth, sleek planes by casting in semi-porcelain slip and firing at 1100 degrees. If you hadn't already noticed, let's state the obvious by saying the common denominator in these contemporary figurines are the intricate, fastidious artistry which is put into the care of making all the items within this section. In this section, it is really relevant and right to look at the work of modern artists like Matt Smith and Andrew Livingstone. They are makers of ceramic installations. As installational artists they both ask and answer questions we may all be asking (but might not be consciously aware we are). They are dealing in the commodity of concepts and their work has integrity, mystery and initiation in the truest sense of those words. Their work is not made as part of a commercial undertaking, but as renditions of ideas that question and reflect society and its peoples. For years we (Tony and Peter) made successful figurines for big UK companies - Royal Doulton, Royal Worcester, Coalport. Our work was always conventionally commercially motivated - the main aim to produce something that sold. A single figurine of Peter's could generate close to £2 million pounds of turnover. It was our collaboration with contemporary artists like Andrew Livingstone (we were collaborators on Andrew's Tullie House exhiition in 2010 and we have given lectures to his under-graduate students at Sunderland University), which turned us toward making this website. 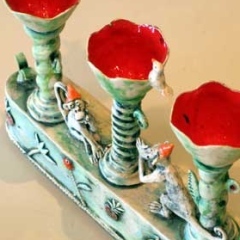 For us at Ceramic Fusion, it is the process of making art which is interesting. 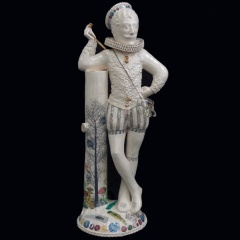 We like the way contemporary ceramics mirrors the same discerning and painstaking approach which was such a hallmark of the late 18th, 19th and early 20th century ceramics. That same ethic is back with a vengeance, to set the mood for out modern lifestyle choices. Follow the links to see more work of this brilliant kind. For each artist, click on their names, or a picture of their work.